The International Workshop and Festival represent the culmination of this project which aims to develop the capacity of young people from 20 communities in Soweto, Westrand and Durban (South Africa), to enhance their skills and contribute positively to the development of their communities through art and culture, which began in April 2012. 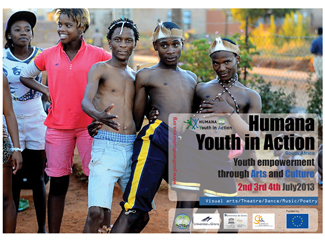 The Youth in Action festival and seminar held from 2 to 4 July in Krugersdorp, Gauteng. 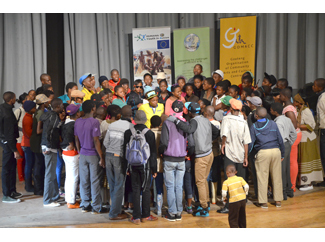 The project, which involves more than 2,000 young people, is demonstrating the creative and constructive force South African youth can develop when given the opportunity and support to learn new skills, interact and formulate their own pojnts of view of importance to their communities. The Seminar emerges as an academic, with the participation of specialists in the cultural and political, donors and other key players involved in the project in order to reflect the power and scope of culture as an engine of progress. During the seminar, share recommendations, knowledge and ideas for use in South Africa and in other developing countries. The simultaneous holding of the Festival, with more than 2,000 participants, will be the best example of the work carried out, involving the implementers of the project, funded by the EU andwith the collaboration ofGOMACC and the Universitat de Girona involves equally to Humana People to People South Africa..
With the combination of the seminar and the festival is to make a strong impact on participants demonstrating the importance of cultural actions to strengthen the development and social cohesion.